A national code-word campaign which enables those who feel vulnerable in pubs and clubs to discreetly approach staff and ask for help which was backed by Essex Police last year, is now taking off in Thurrock thanks to a partnership between Thurrock Police and Thurrock Council. 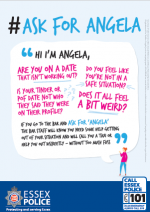 The ‘Ask for Angela’ initiative aims to reduce sexual violence and vulnerability by providing people on a night out with a discreet phrase they can use to gain assistance should they find themselves in a worrying or intimidating situation. As part of the initiative, options available to staff include offering to call a taxi in order to get them home safely, trying to contact friends or family, or as a final resort, asking the individual who may be causing distress to leave the venue immediately.